In our modern digital age, it is easier than ever before to share complex, comprehensive information quickly and easily. The logical assumption, from there, is that the speed with which we can share data should help reduce diagnostic errors. However, the healthcare industry still sees millions of “serious diagnostic errors” every year — more than 12 million errors a year, according to Fortune.com. That’s trillions of dollars in waste, increased levels of physician burnout, and, most importantly, reduction in life expectancy for countless patients. As members of the healthcare community, that’s the last thing you want for your patients. When symptoms seem like the common cold, many patients don’t feel the need to drag themselves from bed and head to the doctor just to be told what they already know. This could be problematic, since symptoms may present as the common cold, but are actually the first indicators of something worse. Virtual nursing assistant programs and online patient portals may be the technology that bridges that gap. If a patient can start a video call with a nursing assistant, that short conversation can provide enough details to encourage a patient to make an office visit or not, as needed. Similarly, medical practice management software that incorporates a chat service can help minimize unnecessary hospital readmissions. Instead, a post-operative surgery patient can ask their doctor virtually about any concerns, and a judgment call can be made from there. It’s also a good way to check in and provide basic monitoring while patients recuperate from the comfort of their home. Pretty much every medical professional is expected to be a “walking encyclopedia” of symptoms and possible diagnoses, especially within their specialty. That’s a lot to remember, even with support from the Internet, studies, actual encyclopedias, and other resources. AI technology is coming increasingly closer to providing diagnostic help that could catch life-threatening diseases earlier. Forbes recognizes studies concerning how AI software has been used to diagnose skin cancers, detect cardiac arrests on emergency calls, and even use algorithms to predict the people more likely to develop cancer so they can receive screenings before cancer symptoms even start to appear. AI technology is also improving to the point that some software can help detect issues on scans that the human eye couldn’t discern. Developing technology can read radiology scans to catch tumors or track the spread of cancer that the physician may not be able to see without assistance. There is also technology to help detect eye conditions, provide “bloodless blood tests,” detect eye conditions through retinal imaging, and even predict diseases through test results and patient information. You can imagine how many of those important details could make a major impact in terms of saving lives and improving life expectancy when potential issues can be caught sooner. Despite the facetious header, there is some serious potential for improvements in the world of medicine creation. AI-powered software offers the potential to provide more accurate testing before a new medicine is ever tested by humans. There are also increasing opportunities to create medications that are targeted to a patient’s individual biology and health needs, potentially improving the efficacy at an exponential level. AI-guided drug testing and development also strives to answer questions like why the flu shot works effectively for some and not at all for others. Let’s face it, most physicians would gladly dust their hands of all administrative tasks — potentially even charting! AI-led practice management software can help optimize nearly every aspect of the patient workflow to automate tasks and enable physicians and staff to focus on patient care. Options like all-on-one-screen charting make it easier to keep a patient’s information at hand and track changes, prescribe medications or find important details. Even seemingly simple tasks like billing, daily to-do lists, and rooming and tracking patients while in the office stand to benefit from AI technology. 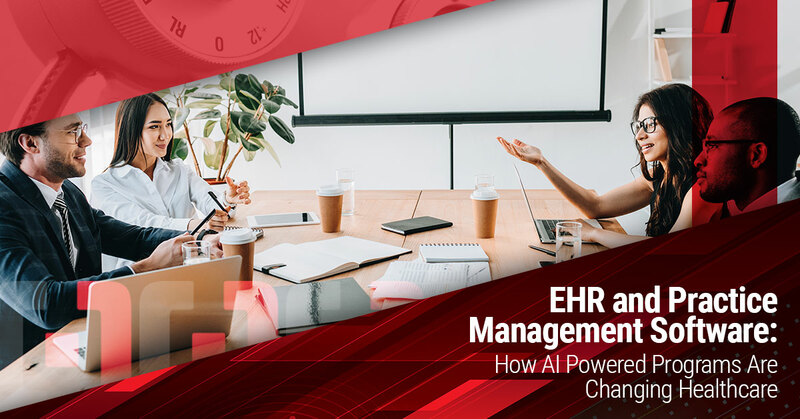 AI-powered clinic management software can generate bills automatically, provide reminders for incomplete tasks, share updated to-do lists with the team, and even learn your clinic’s workflow — and make helpful improvements to the software with that information. For example, software that knows which patient you’re seeing and what you are seeing them for can help customize the workflow accordingly to provide more personalized care. In an overarching sense, this means fewer details falling through the cracks, fewer billing holdups, and improved patient experience and patient care. This technology isn’t out of reach, either. Compulink Healthcare Services offers AI-powered EHR and practice management solutions to help improve everything from workflow to patient experience. Better still, we offer solutions designed specifically for your specialty. Connect with us online or give us a call to demo the software and learn more about how our AI Advantage SMART Practice® suite of features can provide an intuitive, all-in-one solution for your EHR and practice management needs.